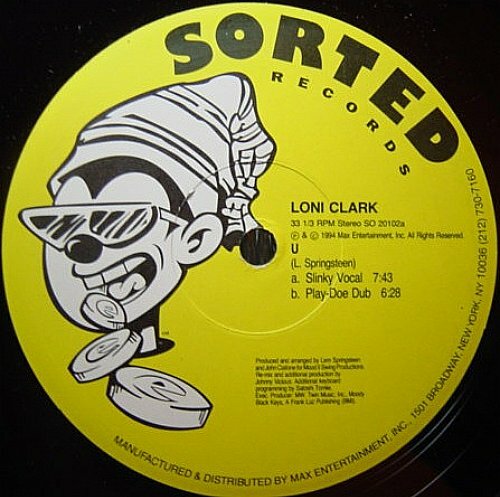 "U" was not Loni Clark's biggest hit, especially as she did actually have a couple of bona fide garage hits in the UK and US, i.e. Rushing and Love's Got Me (On A Trip So High). A Mood II Swing protégé, their great production, her great voice and the great early nineties all conspired to give her a couple of classic tunes... and a couple only: by 1996 her career (or garage career at least) took a serious and seemingly definitive nosedive. "U" did get a UK release with added K-Klass remixes, but for me nothing can touch the completely demented Johnny Vicious remixes. Released on the Nervous sister label Sorted (specialised in druggy tracks, as the label clearly indicates) Johnny was at the top of his game at this time. His Slinky vocal remix is completely off the wall, with trademark stabs and discordant arrangement giving the whole thing a very weird and entrancing feel. However it's the Play-Doe dub that was the killer track for me: completely nuts, with a slow-it-down-speed-it-up-again part that used to devastate dancefloors at the time. Classic stuff. I met Johnny in Paris around the time of the track, and was in touch with him until recently about "U" which he was hoping to find the time to hook out of his computer. That was a year ago, but I suppose he's a busy guy. I also asked Nervous if they were intending on releasing the track digitally. Kevin Williams from "marketing/A&R/promotions" said that he'd look into it, and that I should "keep a look out". That was in February 2006, so I'm not holding my breath for a legal download any time soon. What I've posted is a quality vinyl rip, de-clicked, EQ'd and boosted to get it sounding crisp. The original vinyl is pretty easy to find (here), but no-one seems to have a decent digital copy. Until Johnny finds time to go through his DAT archives or Nervous get their back catalogue online - finally - this should tide you over.